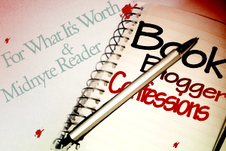 Midnyte Reader: Book Blogger Confessions - Share the Love! (Monday, February 4, 2013). Book Blogger Confessions - Share the Love! (Monday, February 4, 2013). Question: Share the love! In honor of Valentines Day, tell us about a few of the bloggers (and/or) authors you love. Answer: Wow, there are sooo many bloggers I love and even more authors. I started gushing about all the bloggers I adore and it was just getting so long and ridiculous that I had to start over. Let me just say that many of my blogger pals and favorite blogs are on my blog roll (but definitely not all). I just don't want to start naming names because I would feel horrible if I left anyone out and I already feel bad that not every blog that I ever visited and liked is not on my blog roll. There are several blogs that I visit a lot because I love their voice and their point of view. I love the way that some bloggers are so volatile and are not afraid of calling people out and I love the way that others just quietly ignore drama and go on with their blogging. I admire the way some bloggers reviews and posts are literary works of art in themselves and I love the way some bloggers bring up aspects of a book that I did not think of or notice. There are some blogs I visit even though I know we don't have the same taste because I want to know what they're reading and what they've been up to and I do enjoy hearing about the books they've read even if I probably won't read them. So, let me move on to authors. If you know me, you already know that my favorite authors are Stephen King, Robert McCammon and Charles de Lint. I also have never disappointed in Douglas Clegg and I think Neil Gaiman is pretty amazing. I think that Gillian Flynn is incredibly smart and Patricia McKillip is just divine. Then there are the forefounders (in my opinion) of Urban Fantasy, Teri Windling, Emma Bull, and Will Shetterly. I would say because of blogging, I've found authors such as Holly Black, Brenna Yovanoff, Kim Harrington and Kendare Blake. Because of book conferences I've discovered Kelly Meding, Carolyn Crane and Cat Johnson. So a very Happy Valentine's Day to all my fellow bloggers. Thank you for you for your advice, your book recommendations and for making me smile. Most importantly, thank yo for making me feel included, special and valuable. And, Happy Valentine's Day to my favorite authors, who fill my world with books, one of my great passions in life! Labels: Book Blogger Confessions, Valentine's Day. Happy Valentine's to you too, Pam! May Cupid bring you all the books and all the room to store them! I should have done what you did and just wrote a general love letter! I know I forgot people who are important to me or whose blogs I love for all the reasons you mentioned. What a hard question!! I wouldn't even know where to begin answering this question! I love this weekly meme and have put it on my calendar!